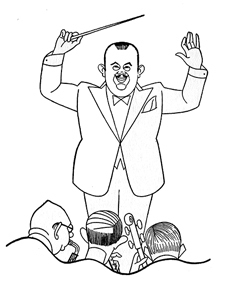 In this chapter from his 1932 book, Times Square Tintypes, Broadway columnist Sidney Skolsky profiles rotund orchestra leader and the King of Jazz (or so he was once known), Paul Whiteman. PAUL WHITEMAN. Let the most important fact come first. He weighs 248 pounds. He once studied to be a mechanical engineer. He has a passion for striped ties and flashy autos. Was born in Denver, March 28, 1890. His father and mother were both six feet tall. His father was director of musical education in the city schools. His mother sang in the choir. Once he enlisted in the navy. Then he organized a naval jazz band. His prize possession is a photograph of himself at the age of three. Here he is seen wearing green velvet pants and playing a toy violin. 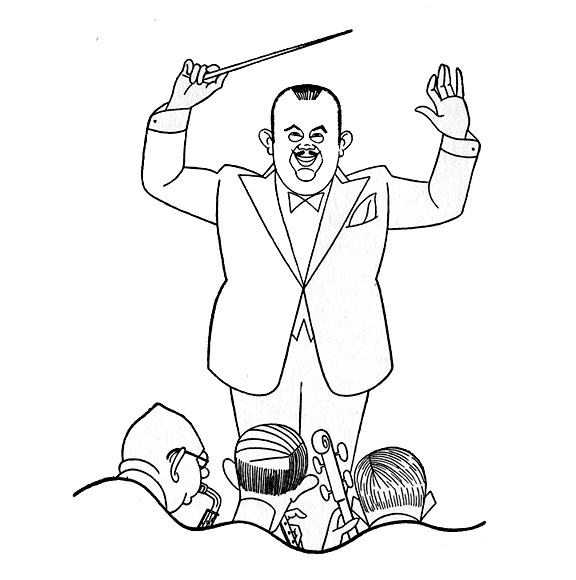 He can lead an orchestra by merely shrugging his shoulders or moving his thumbs. Was a viola player in the Denver Symphony Orchestra and drove a taxi on the side to make money. The Prince of Wales is his pal. He is married to Vanda Hoff, dancer. They have a son, Paul Whiteman, Junior. One of his first jobs in a jazz band was in a honky-tonk in San Francisco. Here the folks threw coins in a barrel if they liked you. These coins were your salary. He plays golf and has one friend he can beat. Will pay any price for a musician he desires. Often takes men getting only $60 a week away from another band by paying them $250 a week. Made his New York d&eacutebut at the Palais Royal. The first place he heard jazz was at Capper’s Neptune Palace in Africa. Never passes a street musician without slipping him a bill. Whenever he attends the opera he cries. His favorite opera is Parsifal. For relaxation he will sit before a victrola listening to records of his band playing. Eats very little for one of his size. Some of his choice dishes are chicken and cream served at the Claypool Hotel, Indianapolis; hot cakes, doughnuts and strawberry shortcake at his relatives’ in Denver; wienerwurst and sauerkraut at Joe’s in Minneapolis and antipasto at Sardi’s. The first record he ever made was “Avalon.” It was spoiled in repeated trials by the audible soft oaths of players cursing their own mistakes. The first of the Whitemans spelled it Wightman. He wears pink nightgowns that fall to his ankles and a tassled night cap.